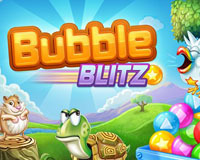 Bubble Blitz is a new time based bubble shooter game on Facebook by PlayQ. 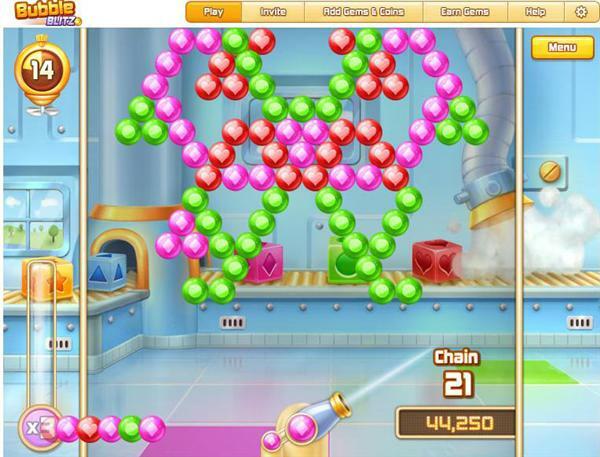 This time you have 60 seconds frenzy bubble popping fun! And your goal couldn’t be simpler, to drop as many bubbles as you can! Well, simpler sometimes isn’t easy to accomplish, and when you have your gameplay sections reduced to only sixty seconds, split-second decisions, quick reflexes and precision make all the difference. As you already noticed Bubble Blitz is not another “limited number of moves” bubble popper, like the most recent titles, Bubble Safari or Lost Bubble, Bubble Blitz is time based and the bubbles keep coming until the last second, as soon as you clear the board, more bubbles follow, all you have to be is quick on both mind and mouse. On one side you won’t get the increasing difficulty levels of other games, the gameplay is pretty much the same every time, but believe me, this in not bad, because the bubbles are randomly placed on the game screen, so you get different designs every time. 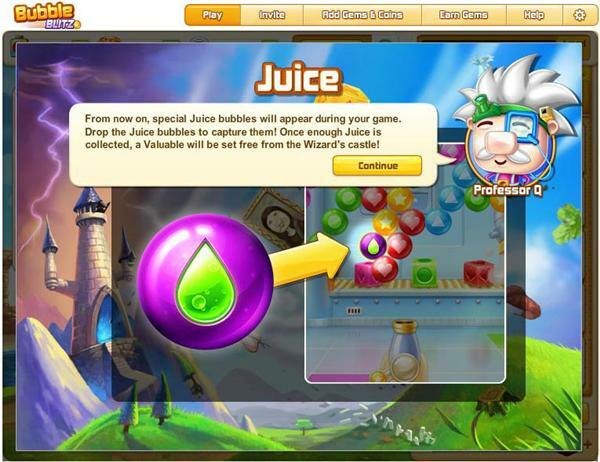 As in other titles, Bubble Blitz is also backed by story to follow along the game that involves gathering juice bubbles to unlock ancient items or valuables, which will allow you to free some of the professor friends imprisoned by a bad sorcerer somewhere. 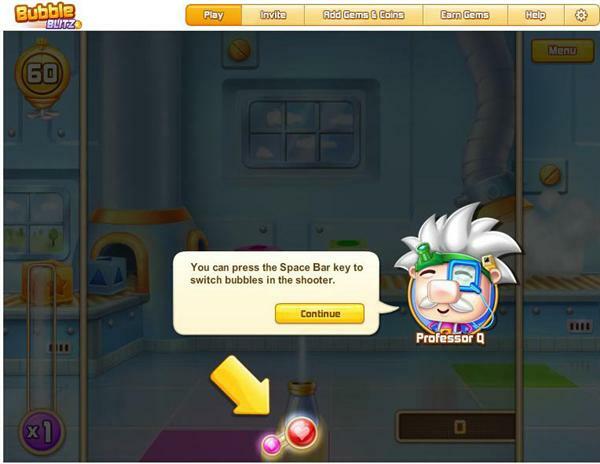 Features are added as you go, you start with some tutorial explanations, how to shoot bubbles, how to use the space key to exchange the current bubble, the importance of side shoots, etc. 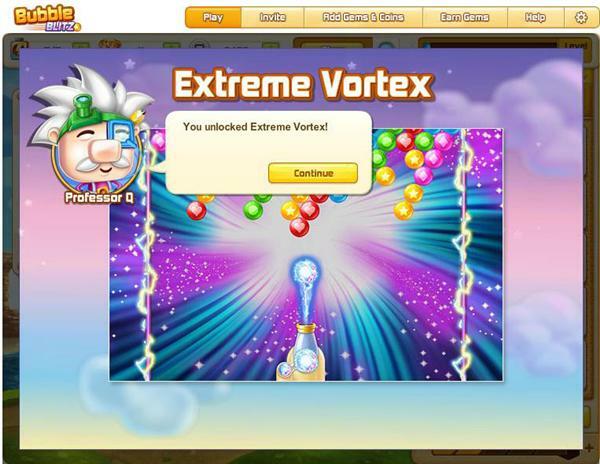 When you reach level 3 you get the extreme Vortex features, which is basically a lighting bubble that passes through everything, this is unlocked by successful chains of moves, or in other words, by not missing any shot. 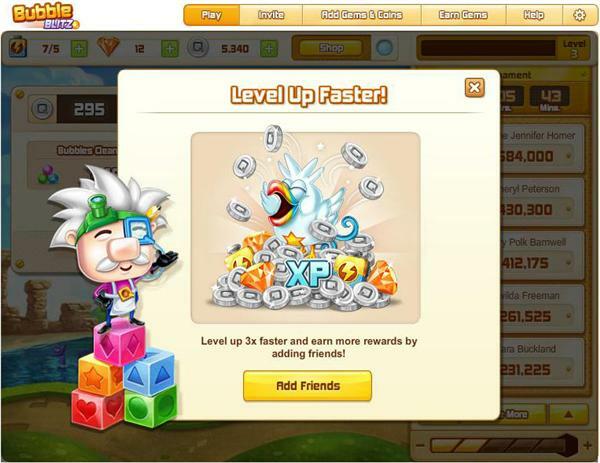 Other power ups are available in the store, like Unlimited energy for 4 hours, double xp or coins, etc. 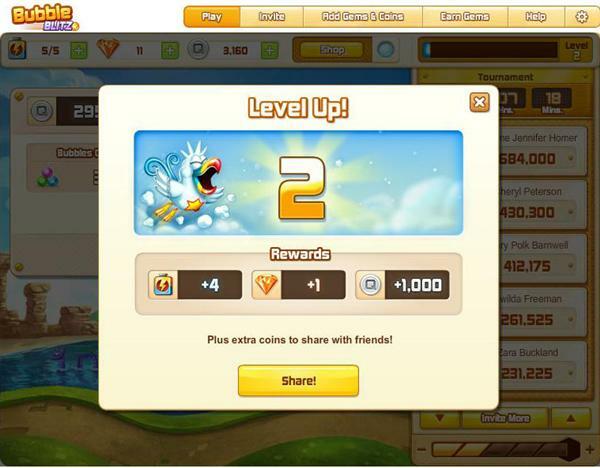 More will also be available as you progress and level up. 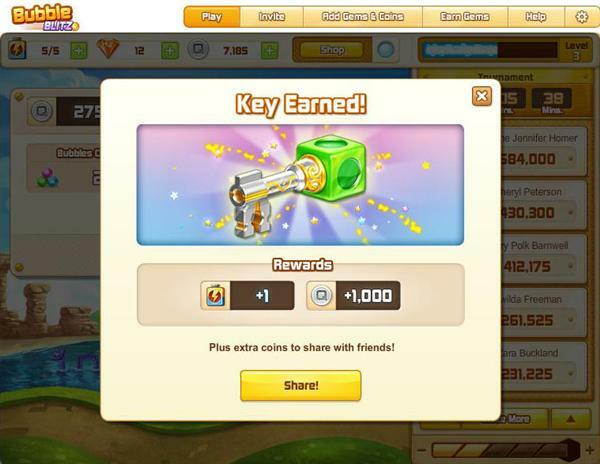 In each gameplay section you spend 1 energy (you start with 5, and you get 1 max per level) and you earn coins and experience, coins are used in the store to buy power ups or energy and experience allows you to level up and progress. 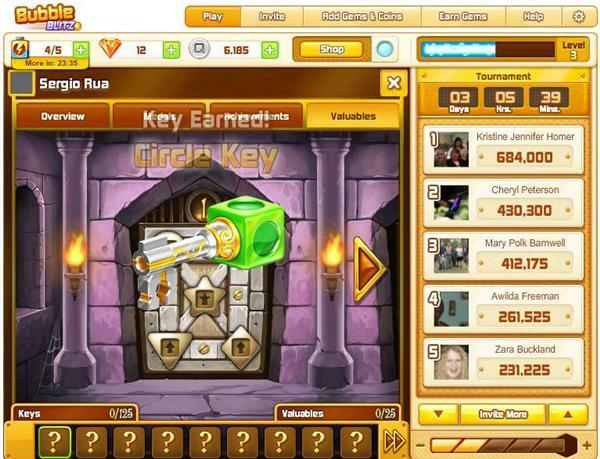 There are also weekly tournaments, achievements, medal, lots of players stats and valuables to collect. Inviting friends will give you increased point and experience too. 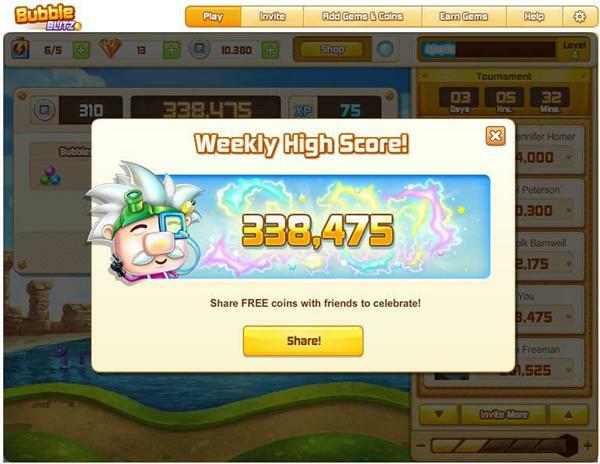 Overall, Bubble Blitz is a great Facebook game, definitely worth playing, it delivers fast paced gameplay and catchy background music, interestingly not annoying even after longer periods of time. Related Tags: bubble popping, Bubble Shooter.